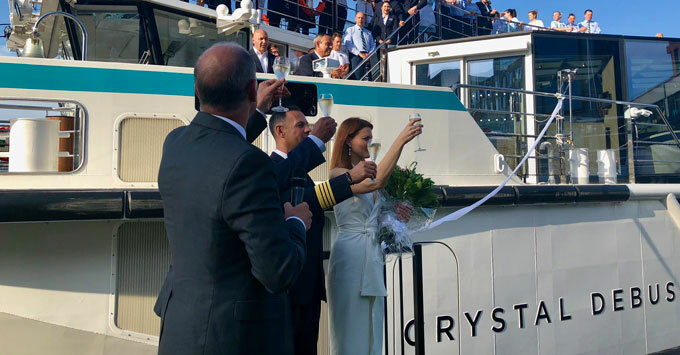 (4 a.m. EDT) -- Crystal River Cruises christened one of its newest vessels, the 106-passenger Crystal Debussy, in a ceremony May 28 in Amsterdam. Broadway actor Rachel York, who will be appearing in the upcoming musical "Head Over Heels," served as the godmother. She is a participant in the line's Crystal on Broadway program, which brings performers onboard select sailings for performances and presentations. The ceremony was live-streamed on Facebook, giving Crystal fans everywhere a chance to hear York sing a gorgeous rendition of Defying Gravity, from the musical Wicked. Crystal Debussy is the second new Crystal River ship debuting this month. Crystal Ravel embarked on May 10, sailing from Basel to Vienna. The 106-passenger ships are identical to Crystal Mahler and Crystal Bach, which launched in 2017; the four vessels are dubbed "Rhine class" ships. Crystal River has a fifth ship, Crystal Mozart, which kicked off the line in 2016. That vessel is nearly twice as wide as the others, and only sails on the Danube. On hand for the festivities were Crystal President and CEO Tom Wolber and Walter Littlejohn, who oversees the line's river cruising division. (For more insights from Littlejohn, read Cruise Critic's ongoing Q & A). In an interview before the christening, Wolber noted that fewer people and smaller shore excursion tours is a differentiator for Crystal River, as compared to other lines. "We don't put 50 people on a bus," he said. "We're trying to uncrowd a crowded experience." Besides controlling the number of passengers on excursions, Crystal River is scheduling more overnights in ports, so cruisers aren't exploring the same cities at the same time as everyone else. In Amsterdam, for example, the line gives cruisers a choice of Michelin-starred restaurants that they can dine at (for a fee, complimentary for top-tier suite passengers). A sense of spaciousness is apparent when you walk through Crystal Debussy. With only 106 passengers on a ship that is the same size as some that carry 190 people, hallways are wider and the cabins are larger; the smallest stateroom is 188 square feet. Attractive wall moldings, artwork and drapes make the rooms feel more like a hotel than a ship. Crystal's Rhine-class river ships do not have true balconies. Instead, the top half of a room-spanning, floor-to-ceiling window drops down to let in fresh air (and a screen comes down to ward off insects). The set-up does make the rooms feel larger, and also makes the king-sized bed feel less cramped than it might otherwise. The bathrooms boast double vanities and most cabins have a walk-in closet. Other differences that river cruise veterans will notice when they board Crystal Debussy (or any of the line's sister ships): the airy Palm Court lounge. Windows on the sides and in the ceiling stream light into the space, which features décor akin to a luxury hotel. Tables in the main Waterside Restaurant are set up for parties of two and four, as opposed to larger tables; passengers can dine whenever they want and all meals are created a la minute. An alternative restaurant, Bistro Debussy, is at the top of the stairs on the third floor, rather than forward or aft. An indoor swimming pool and some outdoor seating anchors the rear of the ship on the third floor. And while there is less passenger recreation on the sun deck than you might see on other ships, there is a pop-up bar that is manned during the day (with the exception of when the ship is going under low bridges). Cruise Critic will be traveling on sister ship Crystal Mahler this week on part of Crystal's Grand Europe itinerary. Stay tuned for coverage.